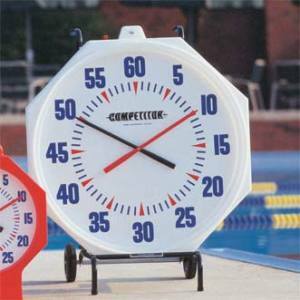 Competitive swimming is steeped in time standards. As a novice, the goal is to move from C times to B times and then on to A, AA, and AAA. From there, junior Olympics, Junior Nationals and Senior Nationals loom large. The ultimate time standard is an Olympic trials qualifier. Swimming websites are fraught with local and national age group top-16 times, not only from this year, but for every year dating back to the Pleistocene era. And let’s not forget about the pace clock, every swimmers best friend or worst enemy. There is rarely a day a swimmer jumps in the pool and just swims around aimlessly. We are slaves to the pace clock, always and forever. It is no wonder then, that after being immersed in a culture that places so much emphasis on time, I am still time obsessed in training and racing. As a triathlete, as surely as I was racing my competitors, I raced the clock. Every race was an opportunity to set a new PR in any of the three disciplines or for the whole event. One of the reasons I often frequented the same event year after year was to obtain a direct comparison of my progress – could I go faster than I did in the past? It is hard to compare a time at St. Croix 70.3 to Eagleman 70.3, but the task of comparing St. Croix 70.3 over a 5 year span makes more sense. I realize that conditions change from one year to the next, giving me a perfect excuse when slow times emerged, but there is still an overall sense of comparison that let me know if I was improving, stalling or even, yikes, sliding backwards. The bottom line: triathlon is place focused and not time focused. A top placing will get you to Kona, but you can set a PR and still not make the cut. This makes perfect sense given the inaccuracies of course measurement, course difficulty and weather patterns. I have spent the last two years running. All of the time conscious habits of my swimming days have reappeared in flagrant fashion. My place in races is far less important to me than how fast I run. I am continually in pursuit of PR’s in the half and full marathon. I pick and choose courses than are amenable to running satisfactory times. In training I push myself on a weekly basis in an effort to eke out a few less seconds per mile than the week before. And that brings me to the last few months of 2012. With the rib surgery behind me and endless opportunity in front of me, I have chosen some races to close out the season. I plan on racing a half marathon in Colorado in September (I cannot decide which one), the Columbus half marathon in October, a local 10k in November and the California International Marathon (CIM) in December. My goals? To run fast! Most importantly, I hope to run sub-1:18 in Columbus which will set me up for my assault on breaking 2:40 at CIM in December. Heady aspirations, yes, but not entirely impossible. With so many years of injury and despair in the rearview mirror, it feels right to think big. Whether or not these goals come to fruition is secondary to the fact that I even have a chance to dream about them. thanks I didn’t know that it worked like that for people that they are into swimming. I thought that it was just about time. but it is more complex that I thought so.